A Podiatrist or a Doctor of podiatric Medicine is the only health care professional who is fully trained on the foot, ankle and all the related body systems. They go through extensive training similar to medical schools. They are trained in anatomy, chemistry, pathology and pharmacology. A Podiatrist is uniquely qualified to diagnose and treat foot and lower limb conditions and issues. A podiatrist takes care of your feet and its disorders. Podiatry is the health field that can be consulted on everything from simple warts and corns to ingrown toenails, hammertoes and sprains or fractures. Achilles tendonitis is a condition of irritation and inflammation of the large tendon in the back of the ankle. Achilles tendonitis is a common overuse injury that tends to occur in middle-age recreational athletes. The overuse causes inflammation that can lead to pain and swelling. Furthermore, Achilles tendonitis can lead to small tears within the tendon, and make it susceptible to rupture. The Achilles tendon is the largest tendon in the human body and can withstand forces of 1,000 pounds or more. But it is also the most frequently ruptured tendon, and both professional and weekend athletes can suffer from Achilles tendonitis, a common overuse injury and inflammation of the tendon. The most common ankle injury is the ankle sprain, also known as a rolled ankle, twisted ankle, or ankle ligament injury. An ankle sprain is very common and surprisingly easy to do... but thankfully, it is also very treatable. here are three types of sprained ankle injuries: inversion, eversion and high ankle sprains. Inversion is when you roll your ankle on the outside of the foot. This is the most common type of sprain with over 90% of sprains consisting of inversion sprains. Eversion is when the ankle rolls on the inside of the foot and high ankle injuries occur from a sudden outward twisting motion of the foot. Ankle sprains are classified into three classes. Class 1 sprain occurs when the ligaments are only minimally damaged. Class 2 sprains occur when there is some tearing of the ligaments. Class 3 is the classification of the most severe tears and ankle injuries. A sprained ankle creates swelling and inflammation in the ankle. It might be hard to put pressure on the ankle since the nerves in the ankle become more sensitive. With 28 bones and over 30 joints in the foot, it is no wonder that arthritis in the foot is a common ailment for many. Balance and walking can be dramatically affected if one or more of these joints develop arthritis, and the pain and discomfort common with foot arthritis limits your ability to function in a normal manner. In the United States the leading cause of disability is arthritis. There are three types of arthritis; osteoarthritis, rheumatoid arthritis and post-tramatic arthritis. Rheumatoid arthritis is an auto-immune disease, while osteoarthritis is degenerative, usually caused by the wear and tear of the bones, joints, ligaments and tendons. Post-tramatic arthritis, as the name implies, usually develops following an injury to the foot or ankle. The joints in the foot and ankle most often affected by arthritis include the tibiotalar joint, which is the true ankle joint, the first metatarsophalangeal joint, which is where the first metatarsal of the foot connects to the big toe phalange bone, as well as three joints in the hindfoot. Athlete's foot is a common fungal infection that affects the spaces between your toes and the pad and balls of your feet. People often contract the infection from public places where moisture collects, such as at a gym locker room, shower, or pool. Symptoms include burning, peeling and red skin especially between the toes. Athlete's foot generally infects the skin. Bunions are officially called hallux valgus in medical language. The word "hallux" refers to the big toe, and bunions are a foot condition where the big toe doesn't line up straight with all the other toes. The joint where the big toe meets the bones of the foot, called the first metatarso-phalangeal joint, should form a straight line with the entire big toe and the metatarsal or long bone of the foot. In a bunion, the big toe starts moving in towards the other toes. There may be some rotation in the first metatarso-phalangeal joint when this happens as well. A bunion the bump on the outside of the foot caused by the big toe migrating towards the other toes. This bump may be embarrassing because it can become reddened and swollen. Over time, a callus may form over it and thickened skin on the big toe may also result. Bursitis is uncomfortable inflammation or irritation of the bursa. The bursa is a flexible sac filled with fluid that covers and cushions the movement between bones, tendons and muscles near joints. Bursitis can develop due to an injury, infection, chronic overuse of a joint, trauma, rheumatoid arthritis, or gout. Foot calluses and corns develop as a result of increased pressure on a particular area of skin causing it to become thickened and hard. Corns often appear on the tops of the toes, the sole of the feet or even in between the toes. Because of the constant increased and localized pressure on a specific area of the foot generally from poorly fitting shoes, the skin begins to react in a protective fashion and forms a corn. These corns can be either hard or soft in nature. Diabetics can develop a variety of different foot problems. Even the most "regular" of problems can worsen quickly and lead to serious issues coupled with serious health ramifications. Foot problems most often happen when there is nerve harm (also called neuropathy). Neuropathy results in the loss of feeling in the feet. Low blood flow or changes in the shape of a diabetic patient's feet or toes may also cause problems. Other common problems that can be especially dangerous for diabetics include: skin changes, calluses, foot ulcers, etc. Drop Foot is basically the tendency of the foot to drop when an attempt is made to lift it. It is as if the earth is a magnet holding tight whenever one tries to take a step. Usually, there is some problem with the central nervous system that is affecting the peroneal nerve's ability to function properly, i.e., to lift the foot when an effort is made to do so. People with drop foot tend to walk less because it is such a chore, which causes leg muscles to weaken. The underlying cause of drop foot may be a muscle problem or sciatic nerve problem. However, it is more likely the result of stroke, multiple sclerosis (MS), brain trauma, or spinal cord injury. Drop foot is the effect of partial paralysis of the lower leg. Footdrop is not a disease in itself. It may also be symptomatic of some neurodegenerative disorder such as cerebral palsy, polio, muscular dystrophy, or peripheral neuropathy caused by diabetes. The cause of foot drop must be diagnosed in order to determine what therapy is the best choice. Not all therapies will be effective for foot drop conditions caused by different underlying disorders. Eczema is a very common skin condition that generally causes dryness, itchiness and redness anywhere on the body. It can result in a lot of discomfort and even pain in some cases. Typically there is no cure for eczema all though their are treatments that are successful and work very well to get rid of some of the symptoms. Their is a condition known as dishidrotic eczema and this effects your hands and feet. This foot eczema condition is a recurring condition where the skin reacts specifically in areas such as the toes and the soles. While searching for the cause is difficult, it is believed that a type of allergen is responsible for the reaction. Some also blame sweating conditions as the cause of it, either way we can see that their is quit some discomfort associated with foot eczema. Edema formerly known as dropsy or hydropsy, is the increase of interstitial fluid in any organ swelling. Swollen feet and legs, referred to medically as edema. Edema can be caused by a serious condition of the kidney, heart, liver or blood vessels. The most likely explanation for edema is a constrictive wet or dry suit cuff. Prolonged or repeated exposure to a tight wet suit cuff can produce swelling at the end of the extremity, which in this case is the hand. Foot edema is a condition in which the body collects an abnormal amount of fluid in the tissues, which causes swelling and puffiness of the organ. A flat foot occurs when the arch of the foot collapses. The result is that the arch is at the same level as the heels and balls of your feet. Flat feet are relatively common and most people live with them without experiencing pain or discomfort. For others, however, having flat feet causes a number of foot problems, such as foot and leg pain, calf and ankle pain, and swelling ankles. More extreme symptoms include bunions, calluses, shin splints, inflammation, tendonitis, and plantar fasciitis. When the muscles of the foot and/or ankle are over-tired, they have a harder time absorbing the shock of repeated impacts. When they are fatigued enough, the muscles begin transferring the stress of the impact to the bones of the foot or ankle: this is when stress fractures can occur. The most common areas for foot and ankle stress fractures are the second and third metatarsals of the foot and in the heel. Other common places for stress fracture are the outer bone of the lower leg (the fibula), and a bone on the top of the midfoot called the navicular. Improper sports equipment, such as shoes that are too worn or stiff, can also contribute to stress fractures. A fungal nail infection occurs when a fungus attacks a fingernail, a toenail, or the skin under the nail, called the nail bed. Fungi can attack your nails through small cuts in the skin around your nail or through the opening between your nail and nail bed. If you are healthy, a fungal nail infection probably won't cause serious problems. But it may look bad, hurt, or damage your nail or nail bed. A fungal nail infection could lead to more serious problems if you have diabetes or a weak immune system. You are more likely to get a nail infection if you are older than 60, have diabetes or a weak immune system, have a nail injury like a hangnail or an ingrown toenail, wear shoes that make your feet moist or sweaty, and live or work in a hot, humid place. Talk to your doctor about the best way to treat a nail infection if you have one of these problems. A ganglion cyst is essentially a benign, fluid-filled mass that develops near joints and tendons. While the exact cause is unknown, it is generally thought that a defect forms in the tissue surrounding a tendon or a joint that allows fluid from one of these areas to penetrate through into the surrounding tissue. This fluid becomes walled off by fibrous tissue that surrounds it, and the cyst forms. It is essentially a balloon of thick, jelly-like fluid that becomes thicker than the joint or tendon fluid from which it came. The cysts can start off small, and then quickly grow. It is also not unusual for cysts to grow and retract in size on their own. These cysts are generally benign, and cause few issues on their own. However, the location and/or size of these cysts can become problematic, especially in the foot and ankle. Gout is often referred to as the most painful type of arthritis. The high deposit of uric acid in the blood is what results in gout. It can be an extremely painful situation and affects your joints. Gout takes place when your body tends to produce too much of uric acid and cannot dispose the exact quantities. Uric acid is the waste product of the purines. It is processed by the digestive system of the human body. Generally, the uric acid flows in the blood stream and departs through kidneys. When your body produces high level of uric acid, you are more vulnerable to suffer from hyperuricemia. Urate crystals gathered around the tendon areas causes intense pain and swelling during any gout attack. When uric deposits reach to its extreme, the joints around the affected area become inflamed and swollen. The inflammation taking place is the reaction of your body failing to fight off the disturbance caused due to excess of uric acid. With the production of too much of white blood cells, the swollen and inflamed joints experience a burning sensation. Haglund’s deformity (Retrocalcaneal Exostosis) is a common deformation of the foot. This is caused by pressure placed on the back of the heel by shoes. The main sign of Haglund’s deformity is pain in the heel and a bump or knot forming just above the heel where it meets the Achilles tendon. An x-ray is not needed for the diagnosis. There are two ways to treat Haglund’s deformity, the first being wearing shoes that don’t put pressure on the back of the heel, i.e. shoes with no backs or simply going barefoot. By doing this you reduce the pressure which in turns reduces the swelling. Another option is surgery. With surgery the bump is removed with a small cut on the back of the heel. A portion of bone is removed to insure that the pressure does not occur again resulting in the same diagnosis. A bone spur or overgrowth that develops on top of the bone may prevent the bone from flexing as it should, especially when walking. This results to a stiff big toe also known as hallux rigidus. Hallux rigidus commonly affects adults between 30 and 60. There are no good explanations as to why this condition happens to some and not others. But one theory suggests that hallux rigidus is the result of an injury to the toe that damages that articular cartilage. Hammertoe is the term used to describe a bending in the joint of the toe. A hammertoe can occur in one toe or in several toes, with the exception of the big toe. 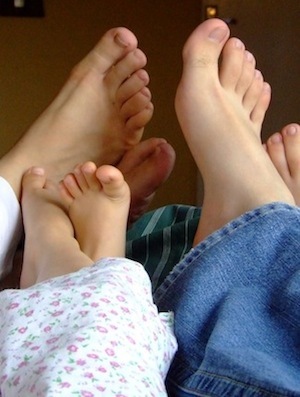 When more than one toe is affected the condition is referred to in the plural, hammertoes. This abnormal bending of the joints can result in unsightly lesions or pain from pressure of the toes when wearing shoes. If you suspect you have a hammertoe consult a podiatrist in Boston to confirm a diagnosis since the condition can get progressively worse over time. Cracked heels are very common. Cracked heels are often referred to as fissures. When the fissures are deep, the skin bleeds easily and causes a lot of pain. Cracked heels are commonly caused by dry skin (xerosis), and made more complicated if the skin around the rim of the heel is thick (callus). For most people this is a nuisance and a cosmetic problem but when the fissures or cracks are deep, they are painful to stand on and the skin can bleed - in severe cases this can become infected. Signs and symptoms that surface on the skin are simple indicators of a faulty internal activity or an external abuse. The edges or rim around the heel will generally have a thicker area of skin (callus). Heel pain, the most common foot complaint, affects millions of people around the world and often occurs as a result of daily activities and exercise. Plantar Fasciitis is the ailment that is often associated with the symptoms of Heel Pain and Heel Spurs. Other causes which can result in a heel pain can be a stress fracture, tendonitis, arthritis, nerve irritation, or, rarely, a cyst. Due to the fact that a heel pain can be caused due to any of the above-mentioned causes, it is vital to have heel pain properly diagnosed. People with high arches can experience forefoot pain that results from the foot distributing mostly over only two points. A lot of pressure is placed on the heel and on the forefoot - the metatarsal region. Ideally, weight should be evenly distributed over the foot as we walk or run. With uneven distribution, the foot arch will struggle to function correctly and will lose balance, alignment and stability. The foot arch has many functions with the primary function of moving our weight from the rear of our feet - the heels - to the front of our feet - the forefoot - as we walk or run. This weight transition is important as it helps our feet to absorb shock. Excessive sweating which is otherwise termed as Hyperhidrosis can affect the armpits hands (palm) feet and face of the body. It affects the entire body system. Excessive sweating can even be a hereditary one. There are two kinds of Hyperhidrosis that a person can experience. The primary Hyperhidrosis is usually not caused by any disorder in the body which can be cured by natural means. They are just the sweating that is found excess as a result of over work or stress. The secondary Hyperhidrosis is one that occurs all over the body as a result of diabetes thyroid and menopause. An ingrown toenail, medically known as onychocryptosis, is a fairly common foot condition that usually affects big toe. It is caused by the abnormal growth of toenail into the skin. The most frequent causes of an ingrown toenail are an injury to the toenail, wearing tight or improperly fitting shoes, and trimming toenails too short or in a curved way. The symptoms of this condition typically include pain, tenderness, redness around the toenail, swelling of the toe, and infection of the tissues that surround the toenail. It should be noted that if not treated properly, it can lead to a severe infection of the underlying bones. Complications can be more serious in people who have diabetes. Morton's neuroma occurs when a nerve in the foot, often between the third and fourth toes, becomes inflamed. The condition involves a thickening of the tissue around one of the nerves leading to the toes. A neuroma is caused by repeated friction and pressure on the nerve, which in turn causes the nerve to scar and become thicker, the result is numbness, tingling, or burning between the toes. Pain or burning also may shoot backwards up the foot into the leg. Ordinarily, there are no outward signs of this condition. Morton's neuroma may also occur in response to irritation, injury, pressure or for unknown reasons. As the day goes on, sufferers may experience more pain that is relieved when shoes are removed. Symptoms are heightened when wearing stiff, restrictive shoes. A foot orthotic is a supportive device that is worn inside of your footwear to change the mechanical function of the foot. During weight-bearing activities such as walking, running or even standing, the foot orthotics work dynamically to improve the stability of the foot. Ideally, foot orthotics will provide full arch contact to give the foot correct biomechanical function. Correcting faulty foot mechanics is a critical function of foot orthotics, as it not only helps the foot and it's many joints but it also reduces unnecessary strain at the ankle,knee and hip joints as well as the lower back. The plantar fascia is a broad ligament-like structure that extends from the heel bone to the base of the toes, acting like a thick rubber-band on the bottom arch of the foot. It plays an important part in the way the foot is intended to operate during walking and running. Plantar fasciitis or inflammation of the plantar fascia happens when the ligament suffers microscopic tears where it inserts into the heel bone, or anywhere along its length. With poor biomechanics, overutilisation or other risk factors, the force on the plantar fascia during the walking or running motion and the change of body weight from one foot to the other can tear the fascia from the heel bone and result in microscopic tears. Plantar fasciitis is a painful and stubborn illness. At its most extreme, the most serious of plantar fasciitis can possibly lead to ruptures in the ligament. Caused primarily by the HPV, or human papilloma virus, plantar warts are hard, scaly growths which occur on the base of the foot, usually in the areas that receive the most pressure such as the heel and the ball of the foot. While the causes and symptoms may vary, treatment for plantar warts is generally simple and usually effective. Peripheral Vascular Disease (PVD) is a serious condition that is characterised by cramping, swelling or numbness in the limbs or some other parts of the body. It is popularly and most commonly known as the case of poor circulation. It happens sometimes when you keep sitting or sleeping for long in one particular position. This condition is common in many men and women across the world. The PVD is defined as a condition wherein the blood vessels are blocked or clogged restricting smooth blood flow and leading to inadequate blood supply to the legs/feet or other parts of the body. The main reason for this to happen is atherosclerosis, the hardening or thickening of arteries. Subungual exostoses are bony projections which arise from the dorsal surface of the distal phalanx, most commonly of the hallux. hey tend to be painful due to the pressure applied to the nail bed and plate. They can involve destruction of the nail bed. A Bunionette or tailor's bunion is like the big toe bunion, but in this case there is a bony prominence on the outside of the foot at the base of the small toe. The term 'tailor's bunionette' originated from tailors in Asia who sat on the ground with their legs crossed resulting in increased pressure on the outside of their feet. This increased pressure caused thick skin formation on the outer aspect of the foot. A skin ulcer is where an area of skin has broken down and you can see the underlying tissue. Most skin ulcers occur on the lower legs or feet. The skin normally heals quickly if it is cut. However, in some people with diabetes the skin on the feet does not heal so well and is prone to develop an ulcer. This can be even after a mild injury such as stepping on a small stone in your bare feet. Venous stasis, or venostasis, is a condition of slow blood flow in the veins, usually of the legs. A patient with venous stasis might be more vulnerable to the formation of blood clot, especially in the deep veins of the legs, called deep vein thrombosis (DVT). Foot warts are a type of warts that can be found at the bottom of the foot. A foot wart is about 1cm in diameter and is generally paler than the nearby skin. It has tiny black dots at the centre. Foot warts have the tendency to group together into clusters. Because it is at the bottom of the foot, this type of wart is generally quite flat. Sometimes it may cause pain because of the constant pressure exerted on them when walking. Further more, because of this constant pressure, it has the tendency to grow back inside the foot.